Shiro Cosmetics is an indie company founded and headed by Caitlin Johnstone. They produce makeup products in small batches, and are very reasonably priced. The reason a lot of people go for indie makeup is because (1) they're cruelty free, (2) they have some truly unique shades and finishes, (3) they have good quality products [note: that has been my personal experience so far] and (4) they have amazing, personal customer service. 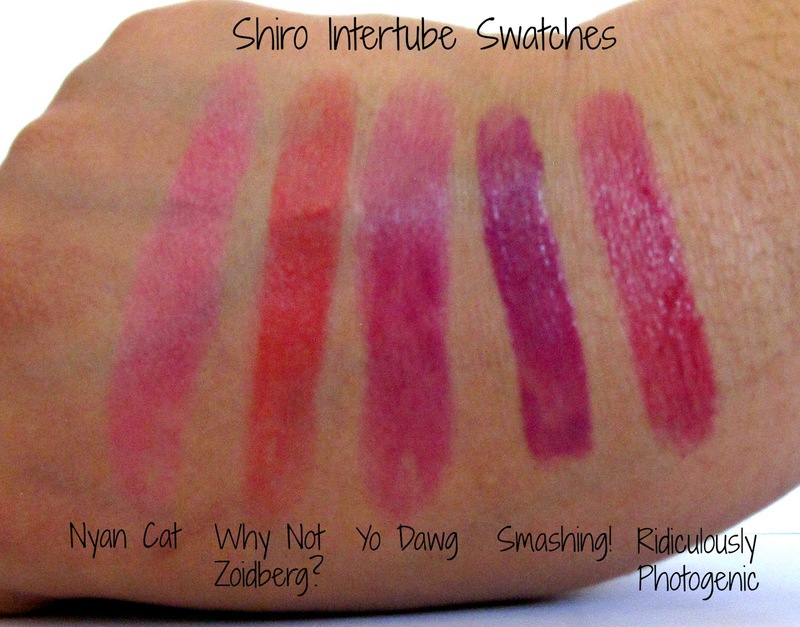 Shiro Intertubes caught my eye first because they were touted to be highly pigmented, and very moisturizing. But what really got my attention was the packaging. You see, every Intertube is named after a meme. I couldn't resist that. 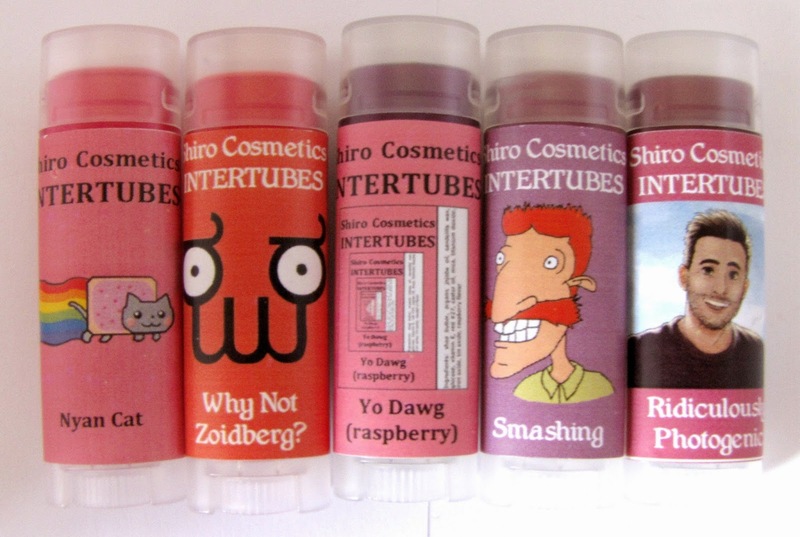 I'd put off getting these because I always thought they were permanent, but in April they announced that the Intertubes would be discontinued. That pushed me into trying them. The packaging is just ordinary plastic; the kind of thing that lip balms come in. They difference is that these are oval rather than round. They're sturdy, and will travel well. As you can see, each of the Intertubes have their own unique design, labelled after the meme they represent. If you want to know more about the individual memes, just Google them! I can't stop mushing over them, I think these are absolutely adorable. It's worth noting that the Intertubes come in 'regular' colors as well as some very unique colors (blue, green, etc). Since I ever only wear 'regular' shades, those were the ones I picked out. Nyan Cat is a bright, cool toned bubblegum pink. It looks intense in the tube, but applies sheerly. The color can be built up with multiple swipes to the color seen in the tube. It glides easily over lips, and feels comfortable to wear. It is not scented, nor does it have any discernable flavor. As it wears off during the day, it leaves behind a stain. Why Not Zoidberg? is a bright, warm, almost neon orange-coral. This is a coral shade that will suit everybody. It can be worn sheerly (single swipe) or can be built up (several swipes). It glides easily over the lips and is comfortable to wear. It is not scented and unflavored, and leaves behind a stain. Yo Dawg is a cool toned raspberry pink. Despite looking very deep in the tube, it applies much lighter. It's a great shade to add some color to your face, because it isn't very intense. This is another shade that will look great on everybody, regardless of skin tone. It glides easily over lips, and feels comfortable to wear. This has a raspberry scent and flavor, and leaves behind a stain. Smashing! is cool toned mauve-purple with a hint of fuchsia. The payoff with this is intense; a single swipe produces the color seen in the tube. This does not have a scent. It glides easily over lips, and feels comfortable to wear, and leaves behind a deeper stain than the others. Ridiculously Photogenic is a warm toned deep fuchsia pink. This was another of the more pigmented ones; a single swipe is enough to produce a very slightly toned down version of the color seen in the tube. This is a shade that will suit most people. It glides easily over lips, and feels comfortable to wear, and leaves behind a pronounced stain. This does not have a scent. Rickrolled is a vibrant, warm red-orange that's just a shade or two away from appearing coral. It applies with medium opacity, but the color can be built up. It is ginger scented, and ginger flavored. It glides easily over lips, and feels comfortable to wear. It leaves behind a stain as it wears off. Shoop Da Woop is a warm, bright tomato red. It applies sheerly and can be built up. It has no scent or flavor. This is a nice red for those new to red lipstick, because it's very easy to control just how 'red' the color appears on your lips. It glides easily over lips, and feels comfortable to wear, and leaves behind a stain. Three Wolf Moon is a deep burgundy red. This was surprisingly one of the least pigmented ones, applying sheerly with a single swipe. Nevertheless, the color can be built up to a deep, vampy shade. It has a cinnamon scent and flavor. It glides easily over lips, and feels comfortable to wear, and leaves behind a stain. Over 9000 is a cool toned medium pink, deeper than Nyan Cat. It had fairly decent opacity. This has a grapefruit scent and flavor. It glides easily over lips, and feels comfortable to wear. It leaves behind a stain. Team Buffy is a deep brown red. It had the best pigmentation of the lot, applying very opaquely with a single swipe. It had no scent or flavor. It felt slightly gritty during application, but the feeling went away quickly - I'm assuming it was the wax/oils in the product melting with my body heat. It leaves behind a stain as it wears off. A couple of points - since these formulas have a lot of ingredients that are moisturizing, the way to get the best payoff is to let them warm up a little. By this, I mean if you keep them pressed gently against your lips, your body heat will melt the formula slightly, and it will apply easily with no grittiness, and also have a better color payoff. Something else to consider - the intensity of the stain left behind depends on the initial intensity of application. If you choose to wear these as a sheer wash, the stain left behind will be mild. If you wear them completely opaque, they will leave behind a deeper stain (and consequently you might get a longer wear time). The oval shape of the bullet makes it slightly awkward to apply, but nothing terribly unmanageable. I'd also like to mention that when I was testing these out, I felt that the formula of some of these (Rick Rolled, Nyan Cat, Ridiculously Photogenic) seemed slippery and 'off'. I contacted Caitlin about this issue, and she generously offered to replace them. Shiro has excellent customer service, and if you email Caitlin about any problems or questions, she will get back to you almost immediately (I'm talking within an hour or two at the most!). This is one of the reason I'm a huge Shiro fan, and will continue to be for a long time. As far as the Intertubes are concerned - I think these are a nice formula, made from very moisturizing and natural ingredients. They're not the most long lasting ones, and can be a little slippery to wear (so use a lipliner with these! ), and yes, you might find similar colors with a 'better' (read: long lasting) formula, but for all that.... I'm charmed by these. 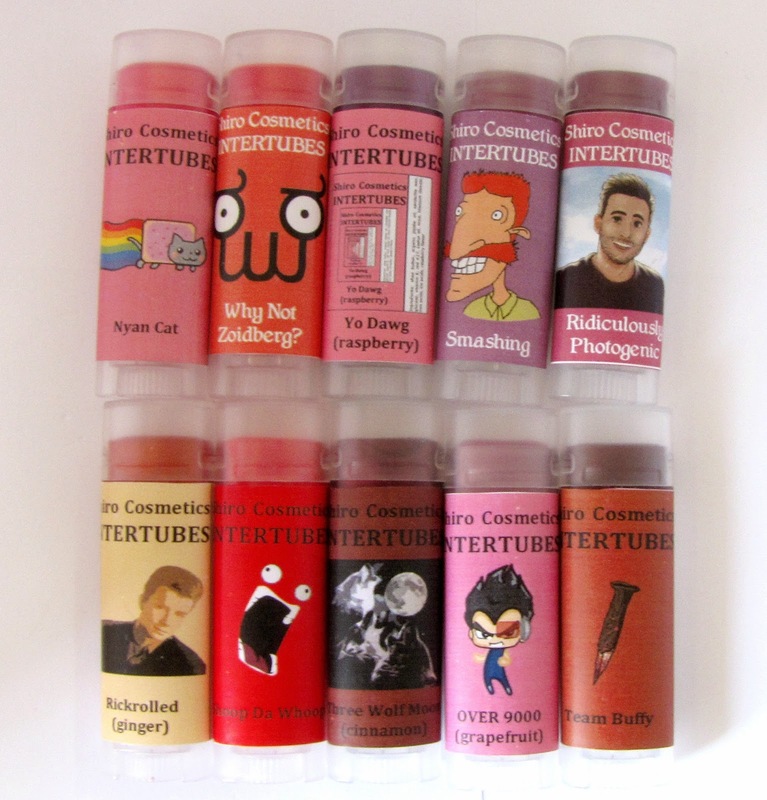 They're meant to be a pigmented lip balm, and at that they excel. If you're suffering from dry lips, and you want a more moisturizing formula - these are a good bet. I'm very glad I have them in my collection, and I don't regret them at all. If anything, I regret that I did not pick up Trololo, Forty Cakes and Sad Keanu while I was placing the order. 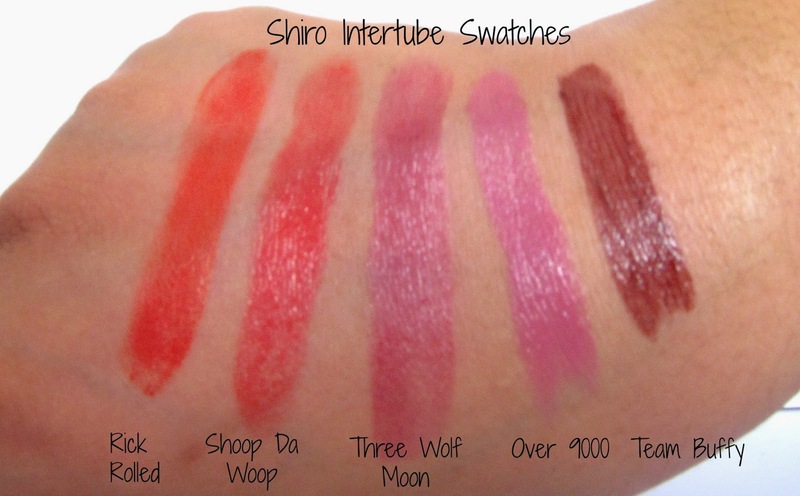 They're still available at www.shirocosmetics.com (look under the 'Sale' section'), but will be discontinued. 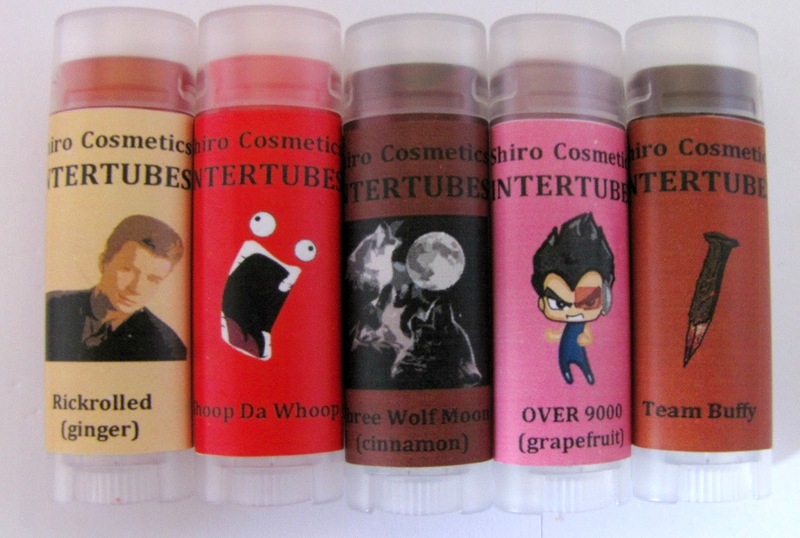 If you want something with the moisturizing formula but a sheerer tint, check out her new lip balms! You gotta give them credit for the awesome names and funny packaging :-) I definitely feel charmed as well.